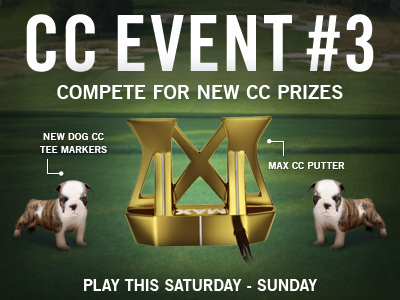 Play CC Event #3 this weekend to compete against other country clubs for new rewards, including new Dog Tee Markers and Flags for your country club tournaments, and the gold MAX CC Rewards gold putter, plus bragging rights. CC Event #3 runs for 48 hours all day Sat 11/29 and Sun 11/30 with multiple 4-hour Clashes, so be sure to play as many games as you can for your club this weekend, and keep your eyes on the Leaderboard. When a CC Event starts, anyone in your country club can enter your country club in the event. Once your club is entered, you'll get matched up with another club, similar to your club's skill level, which starts the Club Clash and a timer will show how much time is left in each 4-hour clash. Each Club Clash is played on nine-holes at either Kiawah, Bethpage, Olympic or Pinehurst No. 2. Post as many good rounds as you can for your country club in each Club Clash, using either a Club Pass or a new Superpass to multiply your points. The winning clubs in each Club Clash receive additional bonus points, and at the end of the CC Event, the Top 1,000 clubs all win some prizes like Speed Boosts, the Top 25 clubs win new Dog Tee Markers and Flagsticks (keep an eye out for a sneak preview as you play in the event!) and the first place club wins the new MAX CC Rewards Putter for a lucky member. 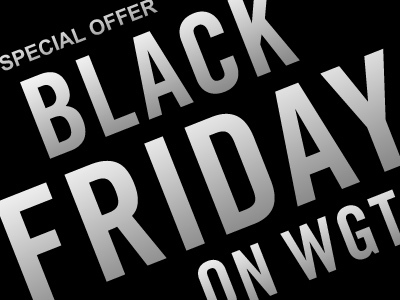 On Black Friday (11/28), buy 2,000 or more WGT Credits in WGT Golf Mobile and get 3 free NIKE RZN Red virtual golf balls. The NIKE RZN Reds are the most popular and top-performing premium virtual golf balls on WGT, giving you more distance and control, plus a slower WGT swing meter. With these, every shot will be easier to hit, go longer and stop on the green faster. This special offer is for WGT Golf Mobile, but WGT players on web can download the free app for iPhone and iPad, log in with their web account, make the deposit in the mobile app then use the free NIKE balls on either the web or mobile games. *Special offer on WGT Golf Mobile only, buy 2,000 or more WGT Credits on 11/28/14 and receive 3 free NIKE RZN Red virtual golf balls (Level 40+). 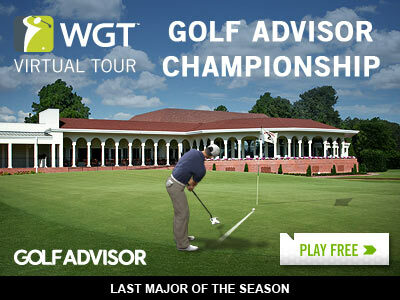 Make sure you post your score in the final Major of the 2014 WGT Virtual Tour season. It's your last chance to move into the top 70 spots on the season leaderboard to qualify for the Virtual Tour Championship in December. 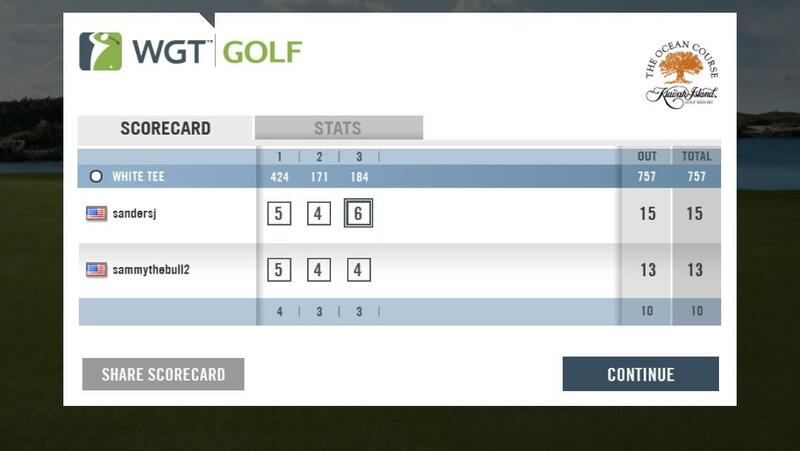 Post your best Round 1 score in the Golf Advisor Championship on Pinehurst No. 2 by 11/25, then play the single-play Round 2 between 11/26-11/30, for your shot at the 400,000 credit purse. 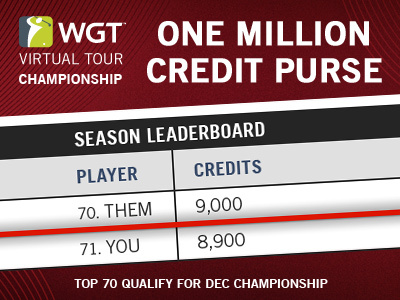 The top 70 scores in each tier on the Virtual Tour overall season leaderboard qualify to play in the Virtual Tour Championship in December, featuring a ONE MILLION credit purse – the largest ever on WGT. Check the Season Leaderboard now to make sure you stay above the cut line! 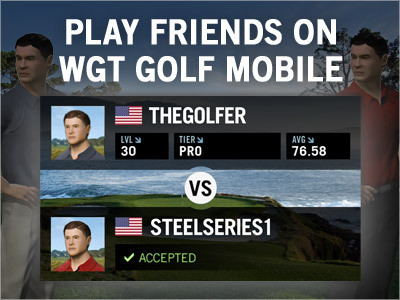 You can now challenge other WGT players in head-to-head multiplayer games on WGT Golf Mobile! Mobile multiplayer games just got better with add and challenge friend options, so you can play against a specific WGT player or friend – just enter their WGT golfer name. You can also invite friends to join you on WGT Golf, right from the app, making it easy for them to join and play against you. This latest update of WGT Golf Mobile also includes a new female avatar that you can select in the Options menu, and of course 15 championship golf courses, tournaments and country clubs. This week's Country Club of the Week is... WGT Pinhunters, a club focused on helping and improving the virtual golf games of their members and the WGT community. The WGT Pinhunters country club has 98 members, including 2 officers, with more than 820,000 Experience Points (XP) earned. At Club Level 5, they have unlocked a number of country club benefits, including a free Putter Pal and Shot Pal for all of their members and earning +2% XP per round. Keep playing using CC Passes to level up your club to unlock these benefits too. "The WGT Pinhunters club idea came from many months working on the Golf Tip Website as a tip site for any WGT player. I wanted to offer a club where anyone can come and work on their game in a fun, easy going club. Once they become confident they can move on to another more competitive club, and I will recommend a few clubs to look at. I have made many friends with other CC owners. One director from a great club even sponsored a 2,500 credit tournament for our club a while back. I have been surprised at the growth of the club, being that we only started September 27th of this year, but it shows the desire of those that seek to better their game. Having a good club director has helped me so much." "WGT Pinhunters is a unique club. Our main goal is to accept every tier, especially the lower tiers that are searching for help. Gary has developed a number of lessons, tools and club tournaments to provide these new members with the guidance to success. We want to teach [new and lower tier players] that this game is just for fun. We strive to give them the confidence to succeed and rise in experience and in skills. If they choose to leave the club once they reach that confidence goal, then Gary will direct them to clubs that he feels best fit their skills. If they choose to stay with the club, they become a teacher and 'pass it on.'" The current Weekly Leaderboard below shows The Peoples Club at the top, followed by Sherbrooke Country Club, The old duffers retreat, The Madrid Golf Club and the Senior Citizens. 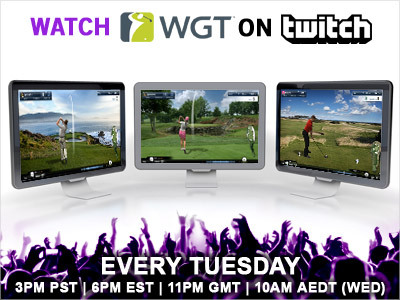 It's 3:00 PM PST, head over to our Twitch page right now - http://www.twitch.tv/wgtgolf - to watch Tour Legend Dougie4042 play WGTicon LIVE. Tune in to watch and listen to all the action, get insights and tips, chat with players, ask questions of your own, plus get a free WGT gift! Words to Live By: "A good driver and a nice putter are all you need in life! What else, you ask? Well, wedges, balls, distance control, patience, nice playing partners..."
In December, WGT will run the first-ever Virtual Tour Championship, with a record ONE MILLION WGT CREDIT PURSE, a value of $10,000 in WGT Credits. The Top 70 players who finish in each of the Pro thru Tour Legend tiers on the Virtual Tour season leaderboard thru November will qualify to play in the December Championship. Held 12/2 to 12/8 for a prize purse of 500,000 WGT Credits. See details below. The top 4 Tour Legends will play in a final round (on a brand new WGT strokeplay course) and will need to stream that round on Twitch, so other players can watch. Held 12/11 to 12/14 for another prize purse of 500,000 WGT Credits. See details below. See final tournament rules and details to be published on 12/1/14. Tune in to watch and listen to all the action, get insights and tips from top players on how they play, and chat to ask questions of your own. Plus, follow along with the Twitch Chat and get a free WGT gift. 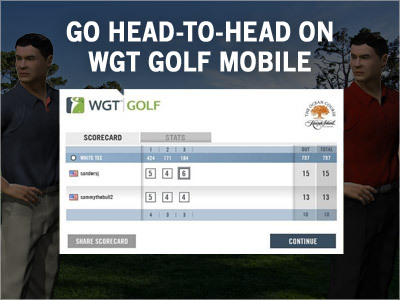 WGT players are LOVING being able to challenge other people in head-to-head games on WGT Golf Mobile on iPhone or iPad. These fast stroke play matches are played on 3 random holes at championship courses like Kiawah, Pinehurst, St Andrews and more. Just like WGT players sammythebull2 and sandersj, as their recent match on Kiawah came down to the last hole, won by the Bull. When you select "Head-to-Head" you'll be automatically matched up with another WGT player to compete on 3 holes on a stroke play course. Check out these scorecards that WGT players are sharing on Twitter and Facebook... Be sure to share yours and we could feature it! Play the iseekgolf Challenge tournament this month to compete for the 200,000 WGT Credit purse. Compete against WGT players in your same tier in this special 9-shot closest-to-the-hole tournament on Celtic Manor, host of the 2010 Ryder Cup. Tournament is open to players in all countries, free to play and runs now through 11/30/14.